In April 2016, EPA announced four winners and two honorable mentions for the 2015 Campus RainWorks Challenge. Teams from the University of Maryland and University of Texas at Arlington earned first place wins. This is EPA’s fourth national design competition created to engage college and university students in reinventing water infrastructure and developing green infrastructure systems to reduce storm water pollution, build resilience to climate change, and develop sustainable communities. 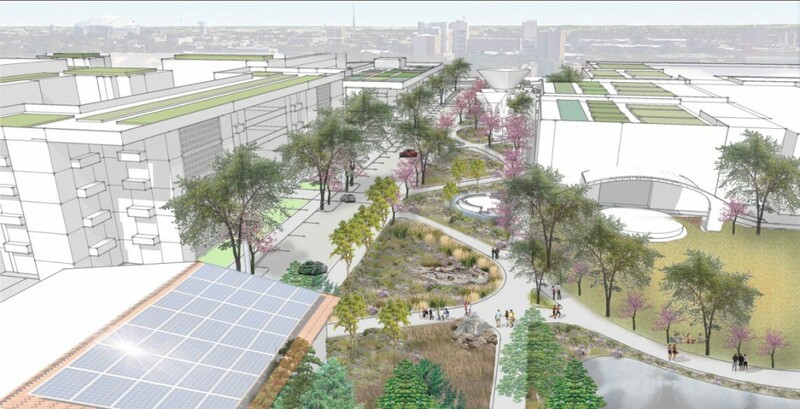 the demonstration project category, which examined how green infrastructure could be integrated into a particular site on the team’s campus. Seventy seven schools from 29 states participated. EPA awarded first prize in the demonstration project category to an interdisciplinary team from University of Maryland, College Park. This is the second year in a row that a University of Maryland, College Park team has emerged victorious. reduce 12.3 million tons of carbon dioxide annually. The team’s design has good potential as a model for other campuses, too. The team consisted of three landscape architecture students, including George Sorvalis, Kathleen Hayes, and Matt Zerfas; Environmental Science and Technology students Emma Giese and Sharon Hartzell; and Civil Engineering student Jason Renkenberger. The students were advised by Dr. Victoria Chanse, an assistant professor in the Department of Plant Science and Landscape Architecture (PSLA). Additional student, faculty, and staff advisors and contributors included Dr. Mitch Paavo-Zuckerman, Dennis Nola, Stephen Reid, Michael Carmichael, Dean David Conrath, Darwin Fuerstein, Diane Cameron, Dr. Peter May, Karen Petroff, Elisabeth Walker, Rick Scaffidi, and Harris Trobman. EPA awarded the first prize in the master plan category to a team from the University of Texas at Arlington. The team’s design concept, Eco-Flow: A Water-Sensitive Placemaking Response to Climate Change, transforms the campus through green infrastructure placed in relation to the natural water flow of Trading House Creek. mitigate 5000 tons of carbon dioxide. The team consisted of candidates for Master’s in Landscape Architecture Baishaki Biswas, Sherry Fabricant, and Jacob Schwarz and Ahoura Zandiatashbar, a Ph.D. student in Urban Planning. Dr. Taner R. Ozdil, a professor in the Department of Planning & Landscape Architecture advised the students. EPA launched the Campus RainWorks Challenge in 2012 to inspire the next generation of landscape architects, planners and engineers to develop innovative green infrastructure systems that mitigate urban stormwater impacts while supporting vibrant and sustainable communities. The American Society of Landscape Architects, American Society of Civil Engineers, and Water Environment Federation are cooperating organizations in the competition and assisted EPA with judging and outreach.